(6720, Joseph Thoburn Collection, OHS). Born in Maryland on September 7, 1811, United States Military Academy graduate William Hemsley Emory gained distinction as an officer in the Corps of Topographical Engineers, participating in boundary surveys along the United States' borders with Mexico and Canada. Emory was a major in the First Cavalry when he came to Indian Territory in 1858 as commander at Forts Washita and Arbuckle. Emory's orders were simple but difficult. His command was expected to stop the Comanche, Kiowa, and Cheyenne in the Wichita Mountains from raiding the settlements in Texas and the Chickasaw and Choctaw in Indian Territory. Emory arrived at Fort Arbuckle to find the post in poor state. Buildings were dilapidated, and his troops lacked proper clothes, food supplies, and ordinance stores. As he tried to stabilize the facility, he was ordered to construct another post to protect Texas tribes being relocated to the Leased District. Accordingly, he selected a site on Pond Creek (later Cobb Creek) at its juncture with the Washita River; he named it Fort Cobb in honor of Secretary of the Treasury Howell Cobb. For the next year and a half Emory's troops kept the area pacified. Emory was meanwhile ordered to Washington, D.C., to serve on a panel to reform West Point's curriculum. In Washington he found civil war imminent and hastened back to Indian Territory. War erupted as he reached Fort Smith. Knowing that Texas had seceded and Arkansas would secede and that they would probably attack his command, Emory made a fateful decision. He ordered his men to abandon all three forts and march to meet him. After intercepting his Fort Washita troops near present Emet in Johnston County, he turned north to collect the soldiers of Fort Arbuckle, then those of Fort Cobb near present Minco in Grady County. From there he guided his force to Fort Leavenworth, Kansas. Emory's action allowed the Confederate forces to occupy Indian Territory. Moreover, the Federals' departure undoubtedly helped assure that the Five Tribes and the reservation Indians would join the Confederacy. 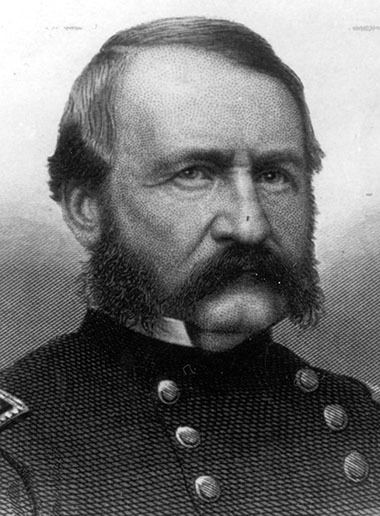 Emory went on to be a heroic general and the Reconstruction commander of Louisiana. He died in Washington, D.C., on December 1, 1887. James C. Milligan and L. David Norris, "Keeping the Peace: William H. Emory and the Command at Fort Arbuckle," The Chronicles of Oklahoma 69 (Fall 1991). William Brown Morrison, Military Posts and Camps in Oklahoma (Oklahoma City: Harlow Publishing Corporation, 1936). L. David Norris, James C. Milligan, and Odie B. Faulk, William H. Emory: Soldier-Scientist (Tucson: University of Arizona Press, 1998). Muriel H. Wright, "A History of Fort Cobb," The Chronicles of Oklahoma 34 (Spring 1956). L. David Norris, "Emory, William Hemsley," The Encyclopedia of Oklahoma History and Culture, https://www.okhistory.org/publications/enc/entry.php?entry=EM001.